He gave His Son to save from hell. By His Son, He gave us His truthful Word. We cannot ascend into heaven; we just do not have the wings for it. However, He descended, the Son of Man. Peter preached David did not ascend into heaven, but David’s King and Lord did descend. Salvation did not happen in the heavens, but here, right here on earth, the lowest place of human depravity: lifted up upon a Cross. Julius Caesar once crucified several hundred Mediterranean pirates who had kidnapped him. Six thousand slaves under Spartacus’ revolt were crucified, their crosses lining the Appian Way. We are all susceptible to death but how is this one Man’s death, His crucifixion different from all those others crucifixions? The Athanasian Creed goes to great lengths, to make it clear that Jesus Christ is not 50% God and 50% man, but 100% God, 100% man, without dividing the substance. There is no time in which those two natures are separated. How is His crucifixion different? In the scale of justice, God’s Son outweighs sin, death and the devil, the weight of glory, the glory of heaven, concealed in human flesh. The thief on the cross to Jesus’ right knew Jesus was innocent while he and the other thief were guilty as sin. “For these men died for their own sins, but Christ for the sins of others.” (Pr. Murray) Peter could only quote Isaiah that in Jesus “He committed no sin, neither was deceit found in His mouth.” Isaiah knew he needed cleansing by the Lord. Even the Roman Procurator Pilate said I cannot find this man guilty. Nicodemus knew that by Jesus’ deeds, God was somehow working in Jesus and Nicodemus was seeking. They were all standing in the presence of the thrice Holy God, or trying to. 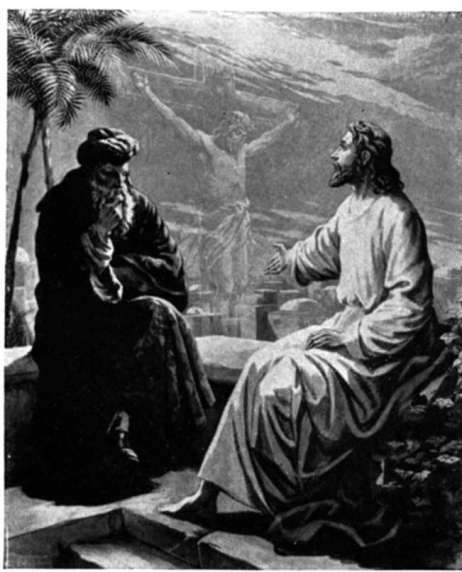 Nicodemus had a map, the map inward: his good deeds, spirituality, religiosity and piety but hearing Jesus maybe Nicodemus began to realize salvation is not in his hands. In town, a man is touting a spiritual journey: literally “The Journey inward”. But this map, the map of the journey inward, was leading Nicodemus down a dead end and maybe he sensed it, knew something was amiss, but there must be something I have overlooked, one more thing I can do. Nicodemus was lost though a ruler in the Sanhedrin. So, Nicodemus sought out Jesus and Jesus turns the tables on Nicomedus with one thing he could not do: be born again, born from above. Incredulously Nicodemus asked, “How can a man be born when he is old? Can he enter a second time into his mother’s womb and be born?” Up until that point, Nicodemus thought his salvation was in his own hands…but hearing Jesus, maybe he began to know it was not. Now Jesus seals the deal: your salvation is in the Lord’s hands, after all, the Psalm has it right of course: The Lord is my salvation, of whom then shall I be afraid? The Holy Spirit blows where He wills and He wills to so breath at one place in particular and every Word leading up to that place and every Word going from that place today and every day: the Cross of Jesus Christ. The Cross-is like a mast of a ship and the sail is filled with the wind of the Holy Spirit. The Father sends the Son and proceeding from the Father and the Son the Holy Spirit. The Creedal map points to a dynamic doctrine of the work of the Lord in our lives through His Word. Doctrine is life. Nicodemus got a lot more than he or you or I could ever bargain for with the Lord. Many people think John 3: 16, “For God so loved the world that He gave His only Son…” is a verse apart and by itself. It is not, it is the Lord’s own answer to Nicodemus’ incredulity. The Trinitarian love of the Father for the Son, the Son for the Father and the love of the Holy Spirit poured into our hearts. He will be lifted up as the bronze serpent was in the map of theIsrael’s 40 years in the desert. The Israelites were biting devouring each other and Moses, sick of manna, sick of the whole journey. Therefore, the Lord appointed poisonous serpents to bite and devour them as they were doing the same to each other. Men began to die. Moses prayed and the Lord said lift up a bronze serpent in the middle of the camp and whoever looks upon it will live. If you were so dying how would you feel? Born again? Israel knew their destination, the land of promise and yet they were lost…whole nations, denominations, families and individuals can be so lost. As Israel was judged, so the Lord saved Israel and has once and for all, and for all the whole world upon the cross, where no man dare ascend, but true Man and true God, Jesus Christ has once and for all and for you. We are to announce the results. Luther: What does such baptizing with water signify?—Answer: It signifies that the old Adam in us should, by daily contrition and repentance, be drowned and die with all sins and evil lusts, and, again, a new man daily come forth and arise; who shall live before God in righteousness and purity forever. Where is this written?—Answer: St. Paul says Romans, chapter 6 : We are buried with Christ by Baptism into death, that, like as He was raised up from the dead by the glory of the Father, even so we also should walk in newness of life. As we have taken the circle as the symbol of reason and madness, we may very well take the cross as the symbol at once of mystery and of health. Buddhism is centripetal, but Christianity is centrifugal: it breaks out. … But the cross, though it has at its heart a collision and a contradiction, can extend its four arms forever without altering its shape. Because it has a paradox in its centre, it can grow without changing. The circle returns upon itself and is bound. The cross opens its arms to the four winds; it is a signpost for free travelers. The cross is our daily signpost when we are lost that the Lord finds us in the depth of His love and we love each other. When do we in particular make the sign of the cross? When we invoke the name of God, Father, Son and Holy Ghost, for our life in prayer to the blessed and Holy Trinity. In Baptism, all are baptized in the Name of Father, Son and Holy Ghost. In Confession and absolution, we turn to the Lord as returning to our baptism for the remission of sins. In Doxology: Glory to the Father and to the Son and to the Holy Ghost.